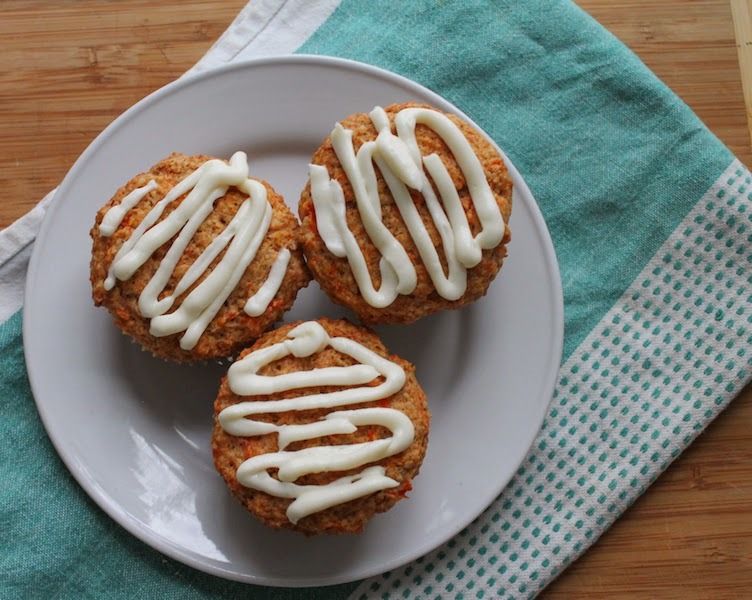 These delicious carrot muffins have all the flavor of tender carrot cake but are made with the two-bowl method traditional for muffins and are topped with generous lashing of sweetened cream cheese. 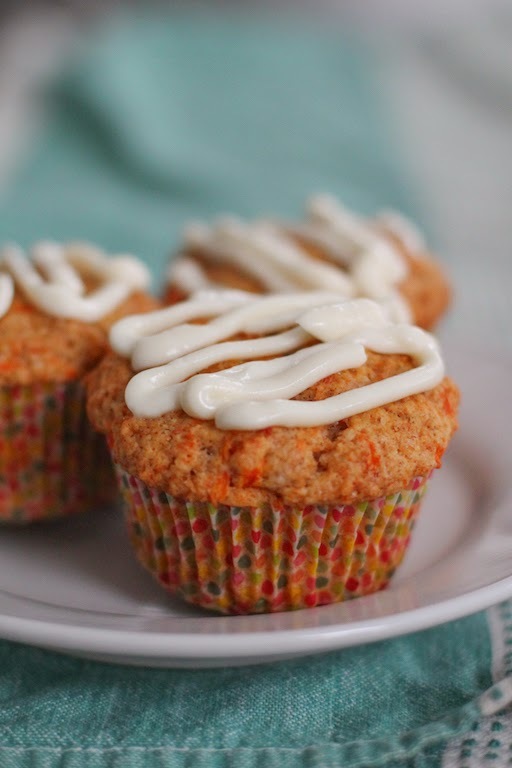 With Easter Sunday less than a week away, you might be looking for a great breakfast or brunch recipe so I thought I’d share my muffin take on carrot cake since carrot muffins are perfect for the occasion. 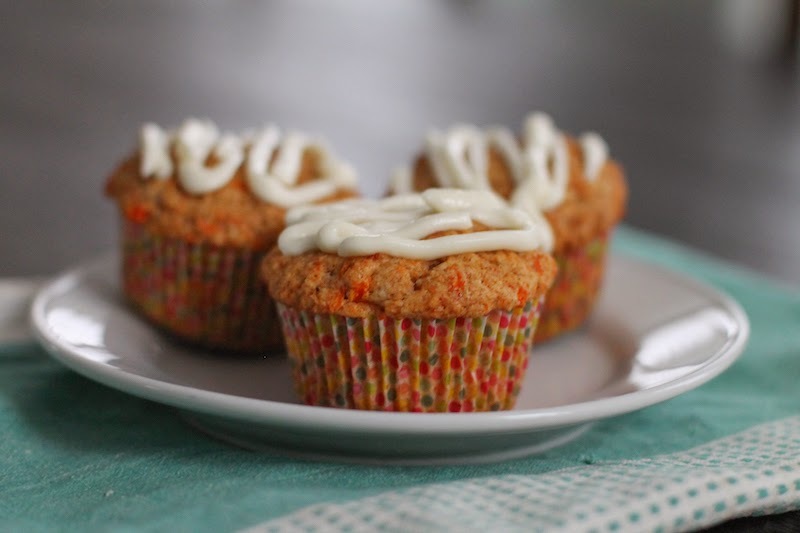 These little guys could also serve as dessert, although they are less sweet than actual carrot cake - a plus for those who have been eating their fair share of Easter candy. The night before I want to serve muffins for breakfast, I like to mix all my wet ingredients together, cover the bowl with cling film and pop it in the refrigerator. Then I mix all of my dry ingredients in a bigger bowl, cover with cling film and leave at the ready near the oven. 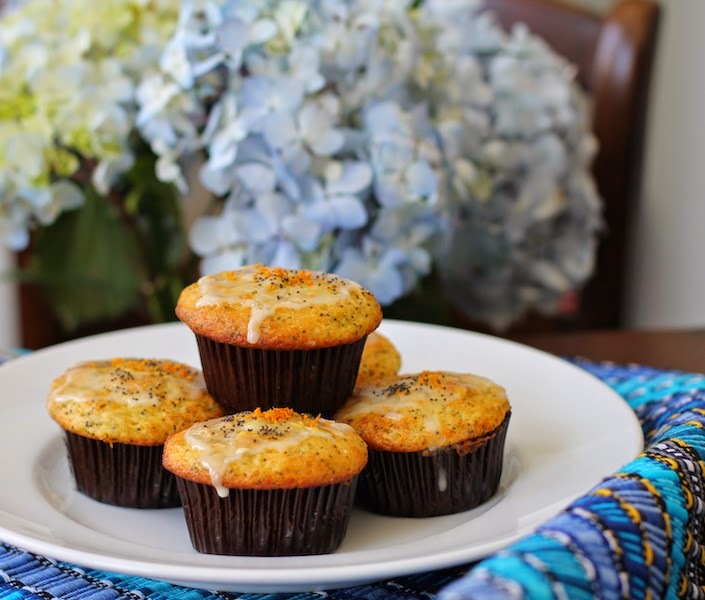 When I get up in the morning, I turn the oven on to preheat and prepare my muffin pan. Pour the wet ingredients into the dry. Mix and bake. The glaze can be made ahead of time as well and refrigerated. This prep ahead method particularly handy on holidays or even on busy school mornings when everyone is trying to get out of the house on time. After all, muffins are fabulously portable. Or mix and bake them right away. 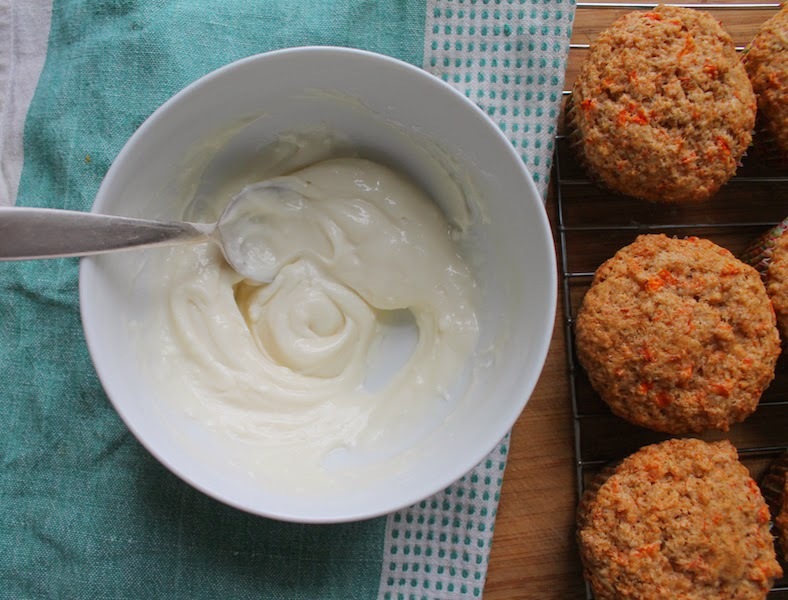 If you've been craving carrot cake, that might be the best plan. Peel your carrots and cut them into short lengths. Discard the green stem ends if any. Boil until tender then drain. Mash with a potato masher until fairly smooth. Set aside to cool. 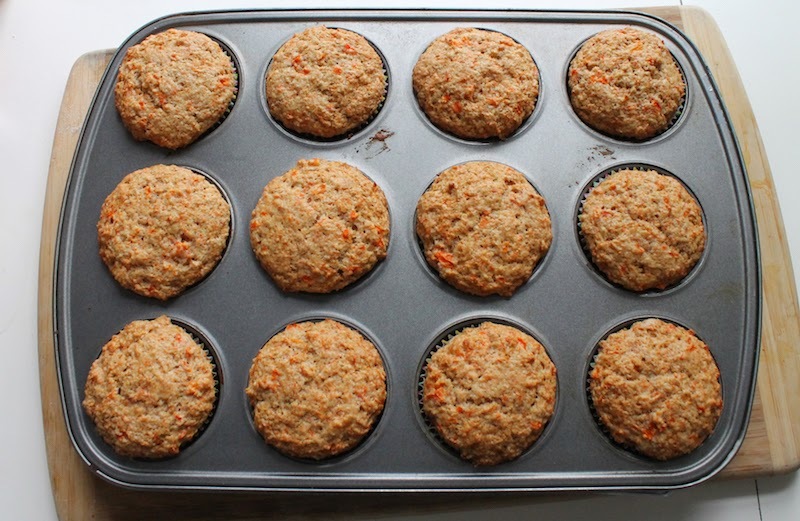 Preheat your oven to 350°f or 180°C and prepare a 12-cup muffin pan by greasing it or lining it with paper muffin cups. 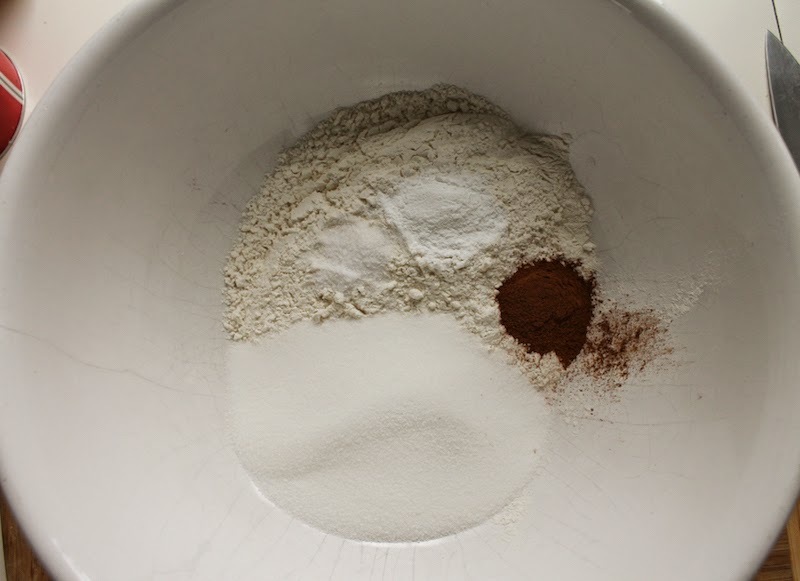 In a large mixing bowl, combine your flour, sugar, baking powder, cinnamon and salt. 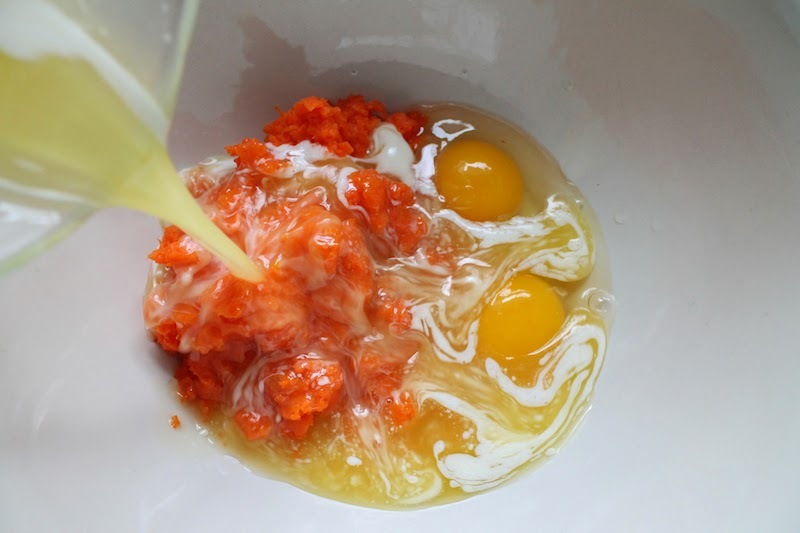 In a small bowl, combine the eggs, melted butter, cooled mashed carrots and milk. Mix thoroughly. 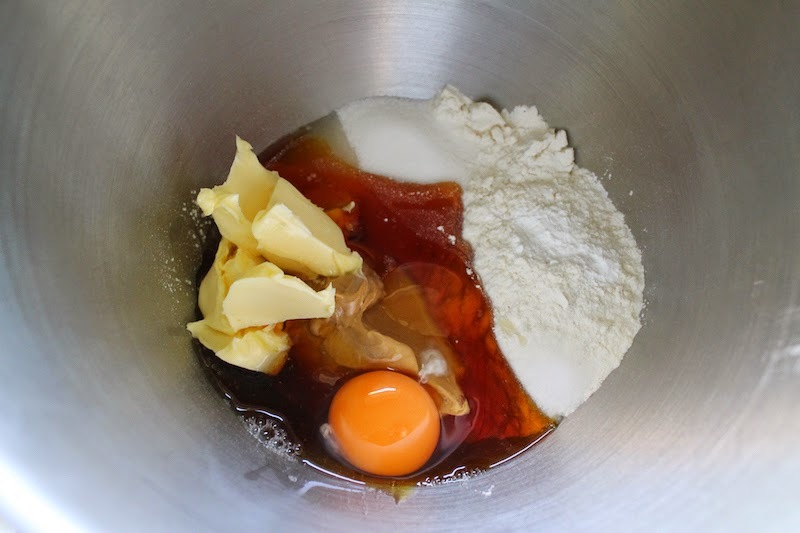 Add the wet ingredients to the dry and stir until just mixed. 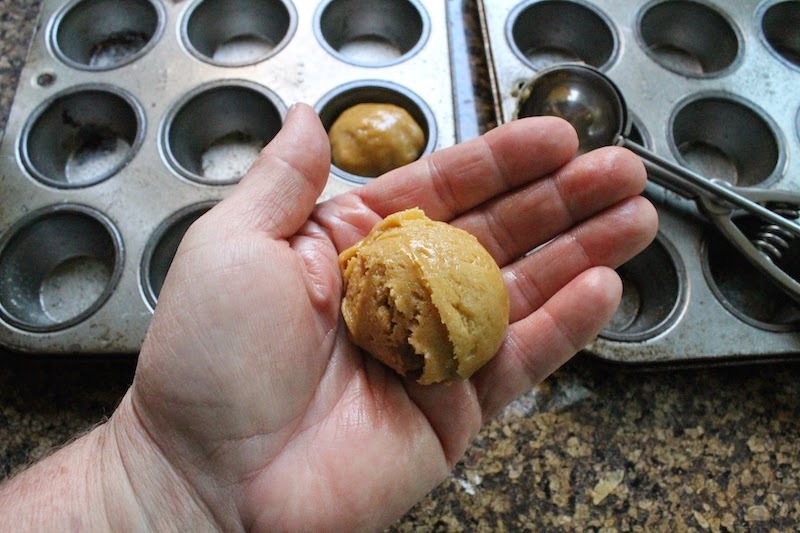 Divide the thick batter between the muffin cups in your prepared pan. Bake for 20-25 minutes or until golden and a toothpick inserted comes out clean. To make the glaze, mix the cream cheese spread with the powdered sugar, vanilla and one teaspoon of milk. Stir well. Add the second teaspoon of milk if necessary to get a good drizzling or piping consistency, depending on how you want to apply it. Make it thinner for drizzling, thicker for piping. 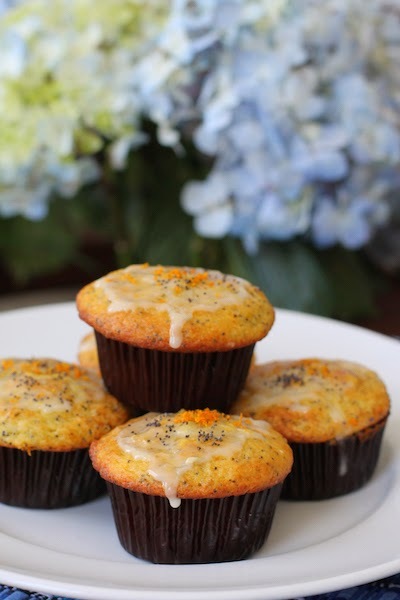 When your muffins are cool, drizzle or pipe on the cream cheese glaze. I used a plastic bag with the corner cut off. 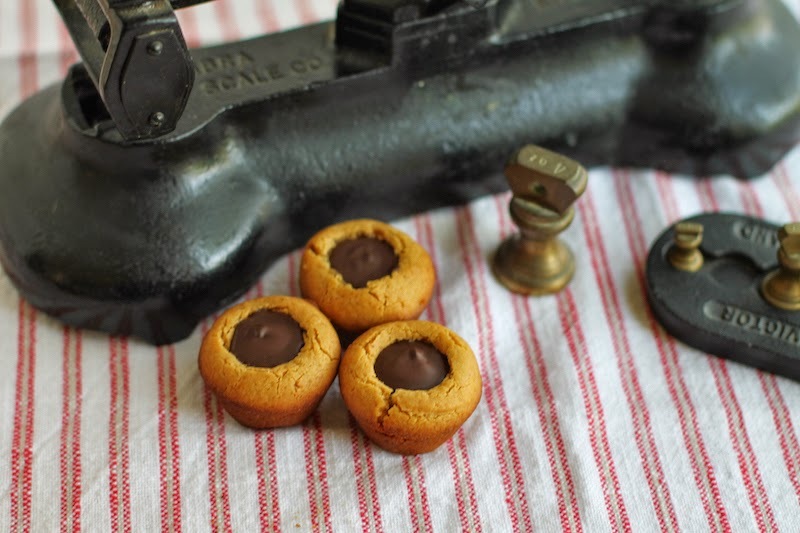 My favorite classic peanut cookie dough recipe, baked in a muffin pan, then filled with dark chocolate. This is how you should celebrate Chocolate Peanut Butter Day! 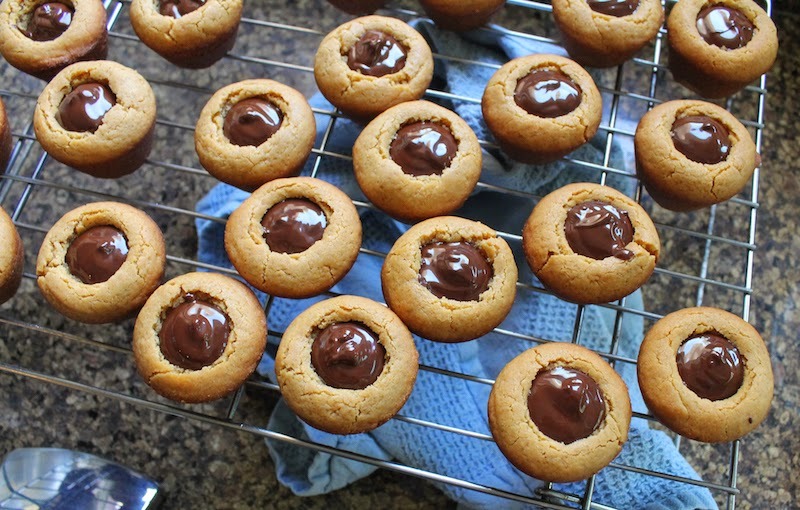 Peanut butter and chocolate fans, have I got a treat for you! 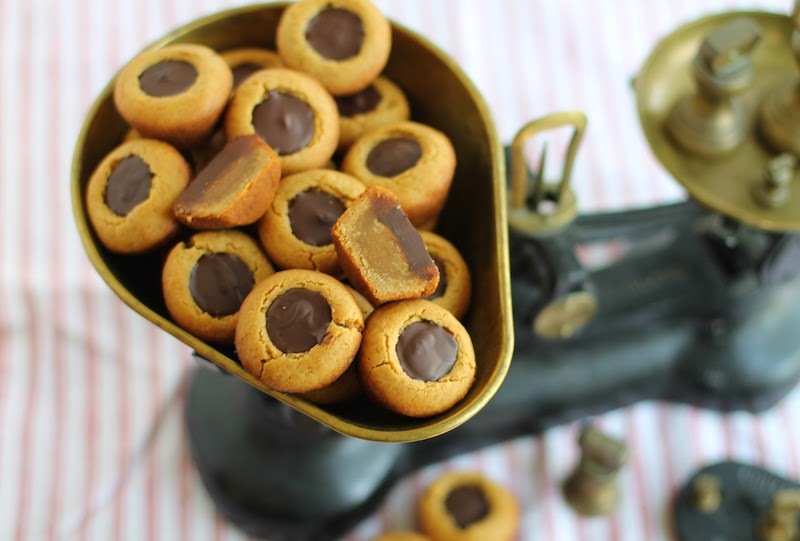 This is the second annual celebration of the completely made up but fabulous holiday, Chocolate Peanut Butter Day, created and hosted by Carla from Chocolate Moosey and Miriam from Overtime Cook, where we share wonderful recipes featuring peanut butter and chocolate. It's a classic combination! You might remember my contribution from last year, Dark Chocolate Peanut Butter Squares, topped with chopped peanut butter Girl Scout cookies. 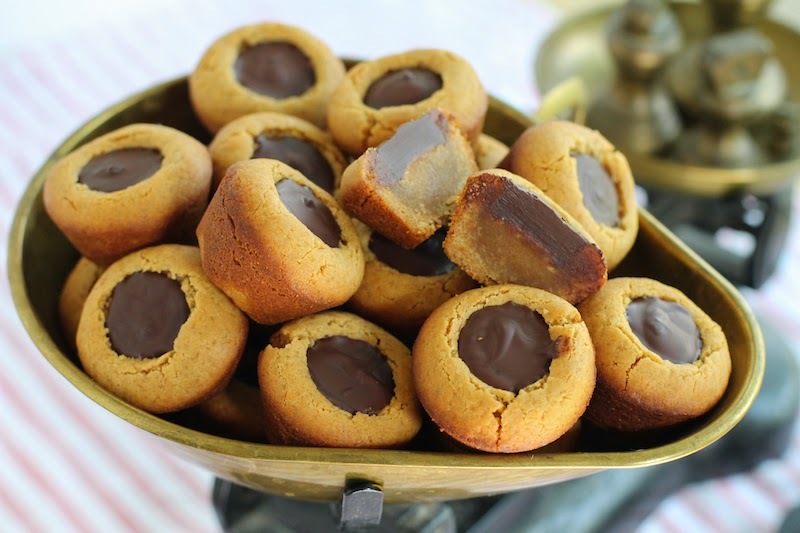 They were so delicious, but I don't think they were as wonderful as this year’s chocolate filled peanut butter cookie cups! Just look at these guys! That is one chewy center. Well, what are we waiting for? 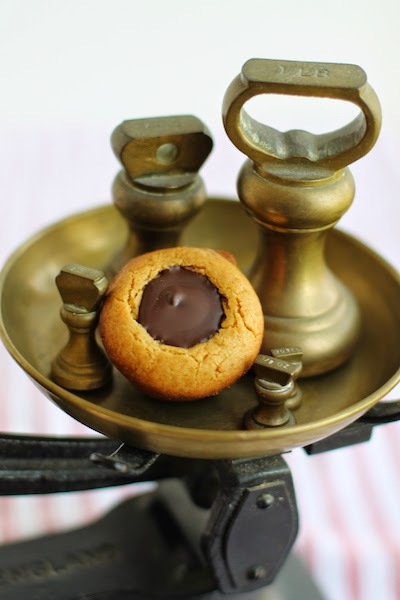 Let's bake some peanut butter cookies with chocolate inside! Preheat your oven to 350°F or 180°C. 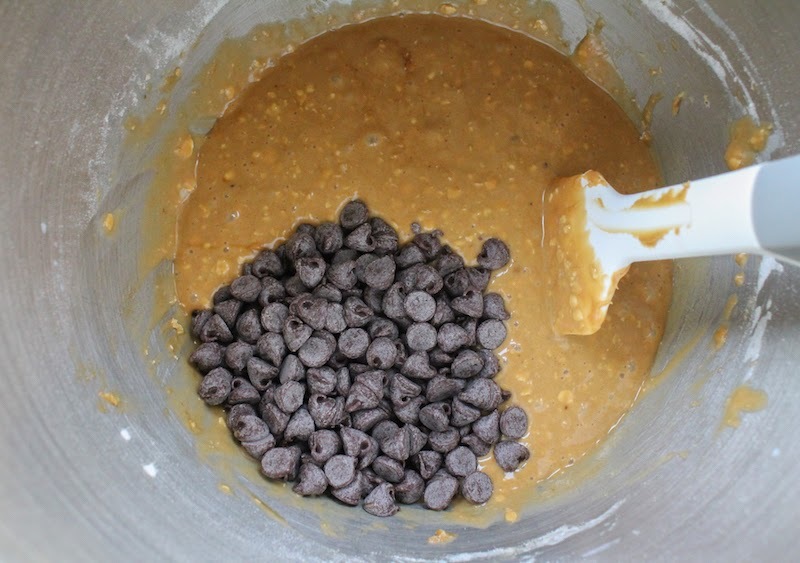 Mix all the cookie dough ingredients together in your mixer until fully combined. Scrape sides down occasionally. 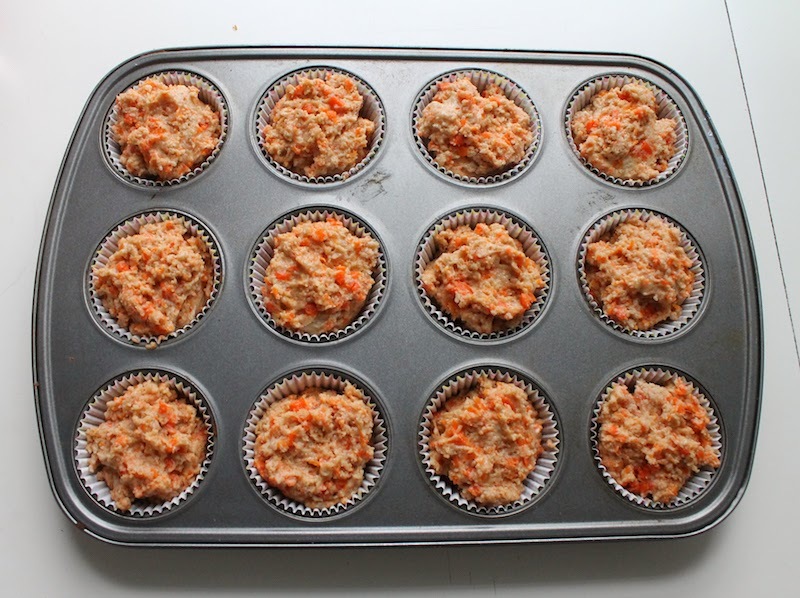 Roll into 24 balls and place in mini muffin pans. No need to grease the pan. 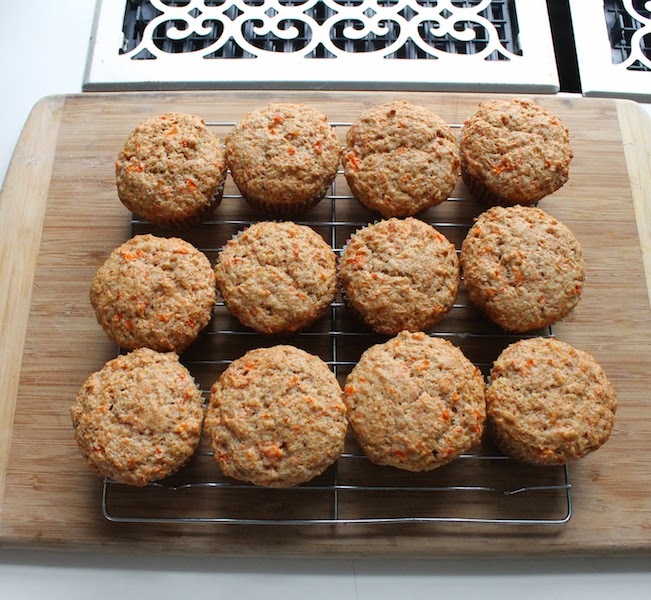 Bake for 15-18 minutes in your preheated oven or until balls are golden. They will probably still be a bit under cooked but it's all good. We are looking for chewy here. When you take them out of the oven, use something clean and cylindrical (As you can see, I used a fingernail polish bottle.) to press the middle of each cookie down to make room for the chocolate. It won't go down far, perhaps half an inch or one centimeter. Leave the cookies to cool in the pan for about 10 minutes then remove them. Leave them cool completely on a wire rack. Melt your chocolate a few zaps at a time in the microwave in a microwaveable bowl. Stir frequently. When it’s pourable, spoon or pour it into the cookies. Give the chocolate time to firm up again before you move them. Store in a cool place in an airtight container. Fair warning: If you take them out to a picnic, keep them in the cooler. The chocolate will melt again in hot weather. Isn’t chocolate and peanut butter one of the best combinations every?! No wonder we celebrate! Many thanks to our two hosts, Carla from Chocolate Moosey and Miriam from Overtime Cook. You two are brilliant! I want to make each and every one of these. Where to start?! 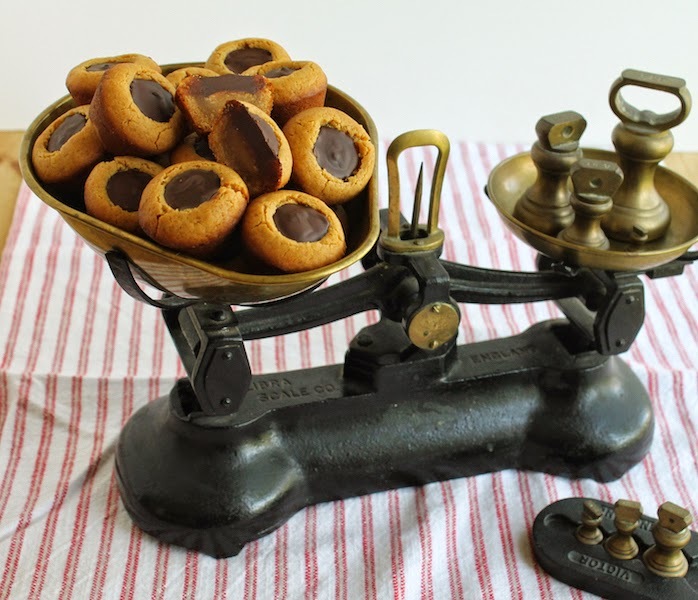 Small Batch Chocolate Peanut Butter Doughnuts by Sarah from What Smells So Good? 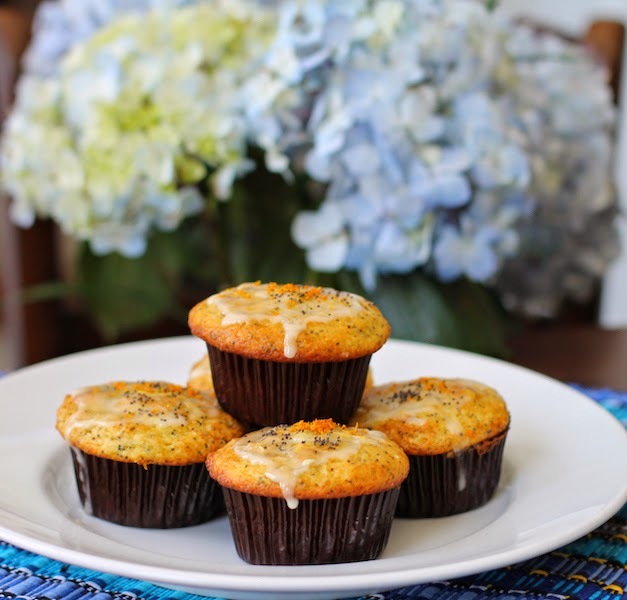 Fresh orange juice and poppy seeds make beautiful sunshiny muffins that everyone will want to wake up to eat! They also make great snacks. As I mentioned yesterday while serving up Irish lamb stew in this space, I am in chilly Rhode Island for the week - my last Spring Break! My baby girl will graduate from Rhode Island School of Design this May. She has been sweet enough to invite me to come each year since she started at RISD, so this is the last scheduled spring break that affects my life and holiday planning. Which makes me both sad and proud. This year, all of her close friends are also staying in town, working hard on their degree projects, so I have put myself in charge of sustenance starting with homemade tomato soup and grilled cheese sandwiches the other night and orange poppy seed muffins today, delivered to their studios as they worked. 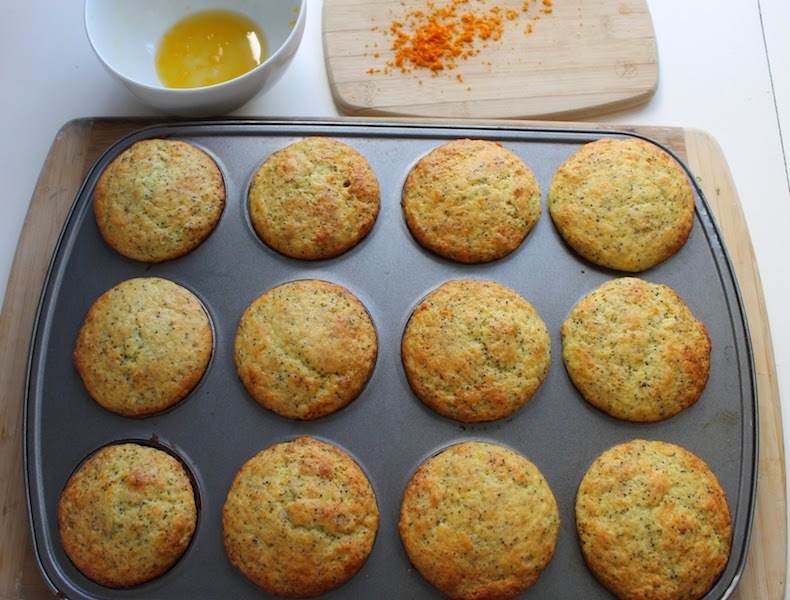 I am later than usual posting the muffins because tonight we ate eggplant Parmigiana and garlicky green beans so I was busy cooking that and scooping them up from studio to eat. It's 9 p.m. as I write this and they've gone back to work! Future meals on the menu include vegetarian crispy tacos and lentil burgers. If you know me at all, you know I am in hog heaven cooking for girls again! 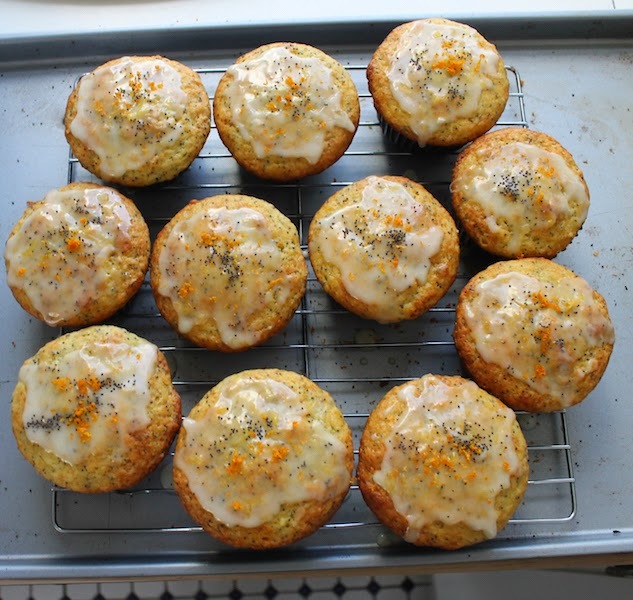 These orange poppy seeds muffins were a special request, one I was only too happy to oblige. 7-8 tablespoons powdered sugar or as much as needed to reach your desired thickness. 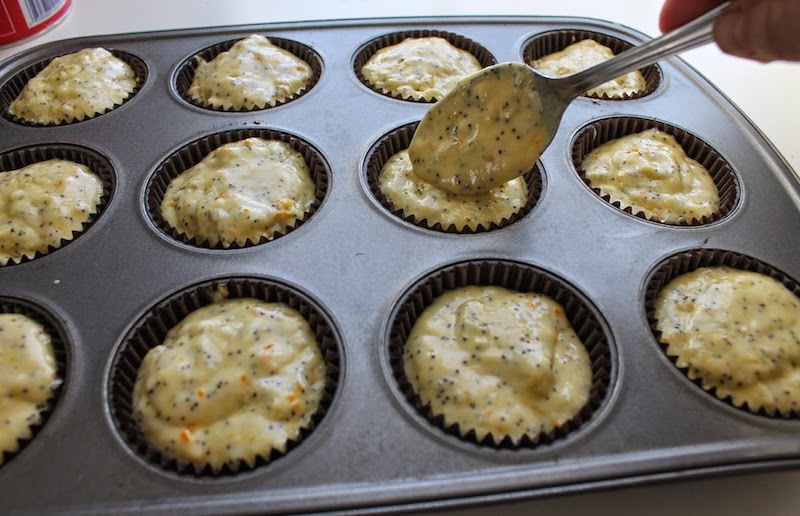 Preheat your oven to 350°F or 180°C and prepare your 12-cup muffin tin by spraying with non-stick spray or lining with muffin papers. 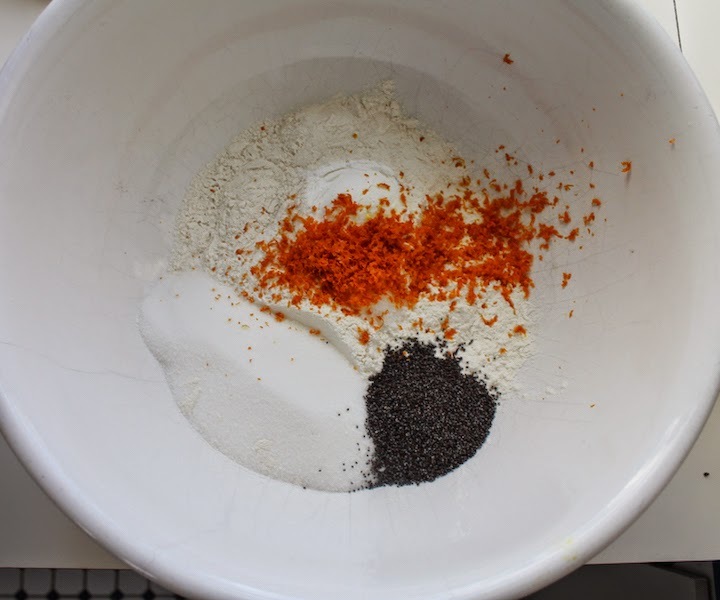 Combine your flour, sugar, baking powder, poppy seeds and salt in a large mixing bowl. Grate in your orange zest. 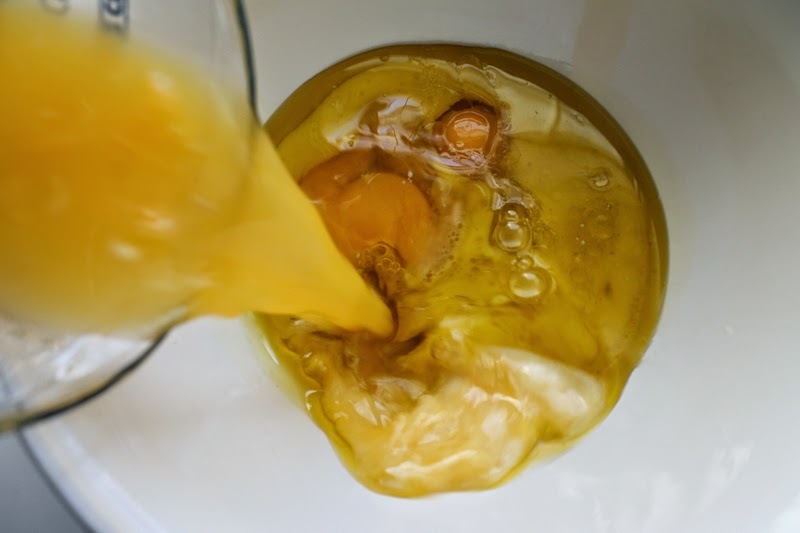 In another smaller bowl, whisk together your eggs, orange juice, oil and milk. 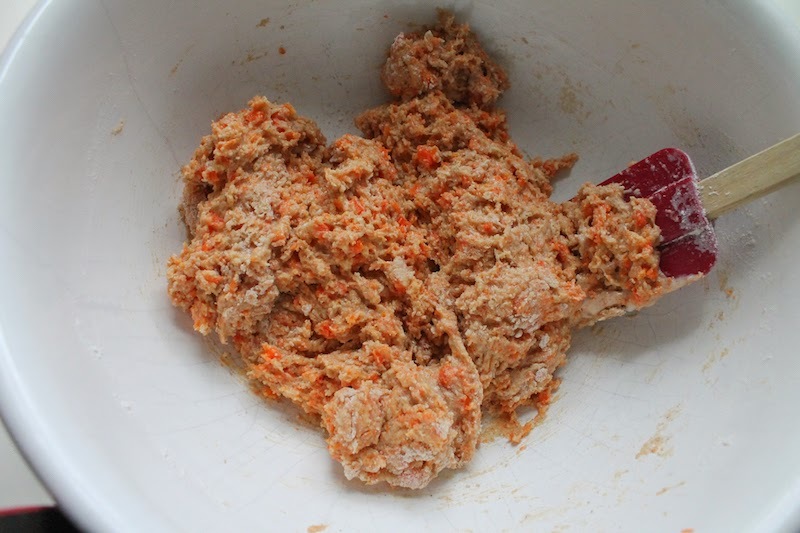 Fold the wet ingredients into the dry ones and stir until just mixed. 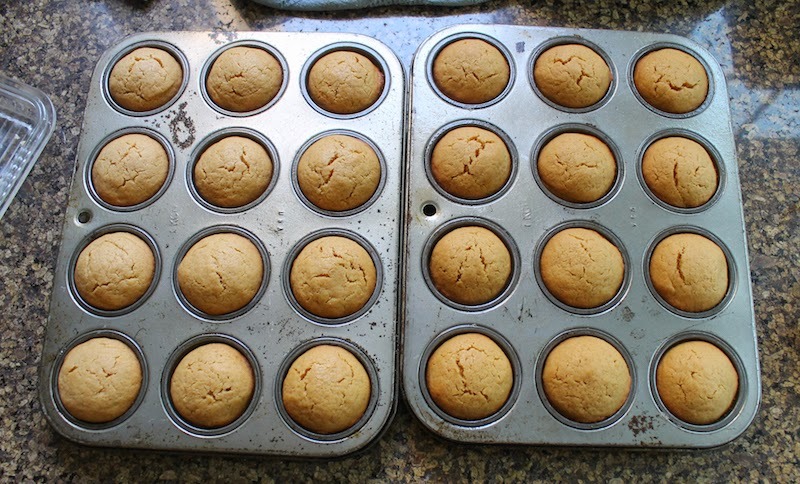 Divide your batter between the 12 muffin cups. 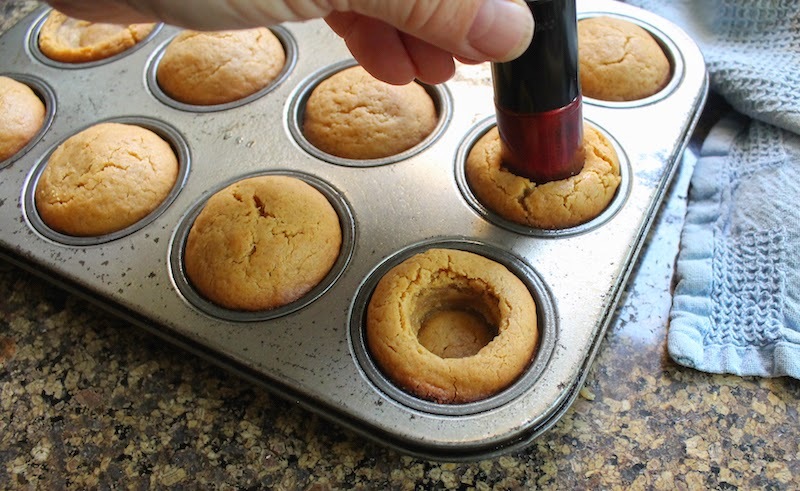 Bake for 20-25 minutes or until an inserted toothpick comes out clean. Allow to cool for a few minutes in the pans and then remove to continue cooling on a wire rack. 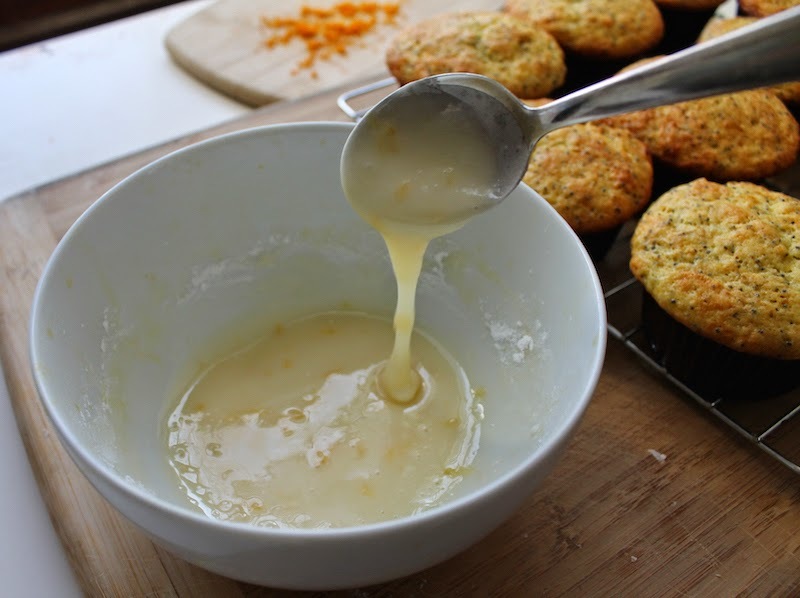 To make the glaze, put your orange juice in a small bowl and then add the powdered sugar a tablespoon or two at at time, stirring well in between, until you reach your desired consistency. 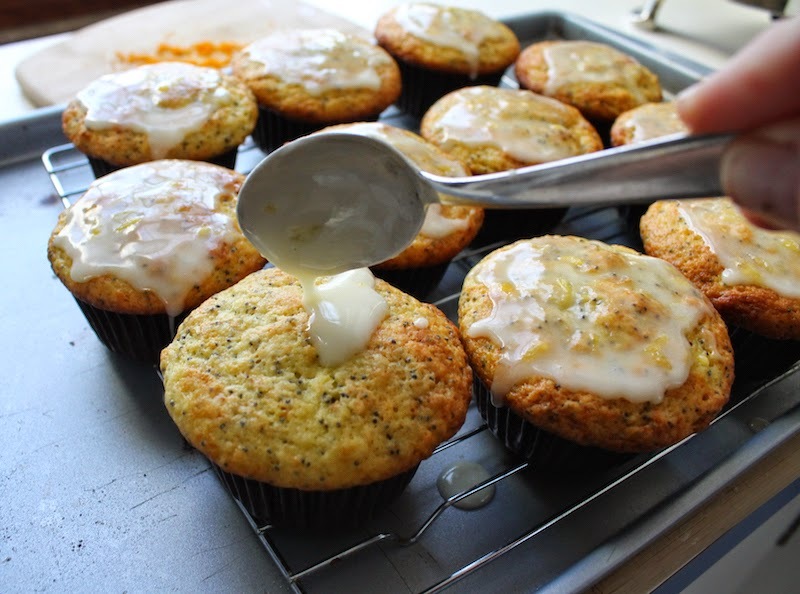 Spoon a little on top of each cool muffin. 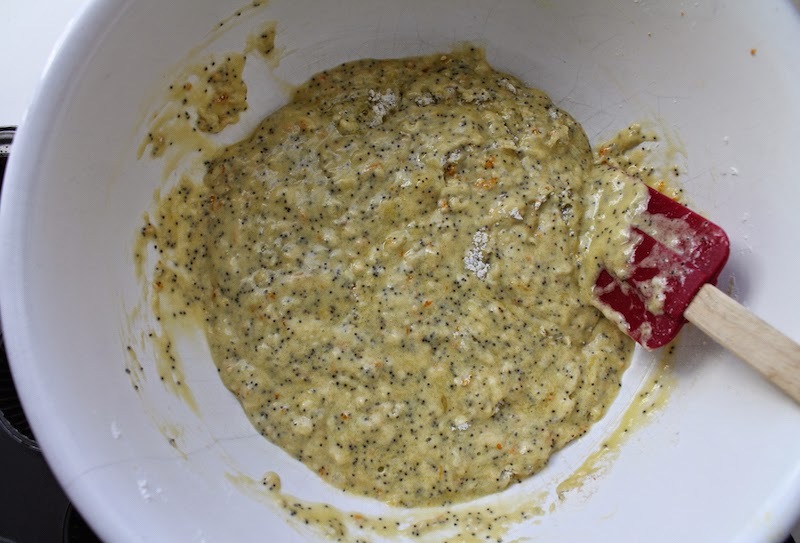 Then sprinkle with extra orange zest and poppy seeds, if desired. 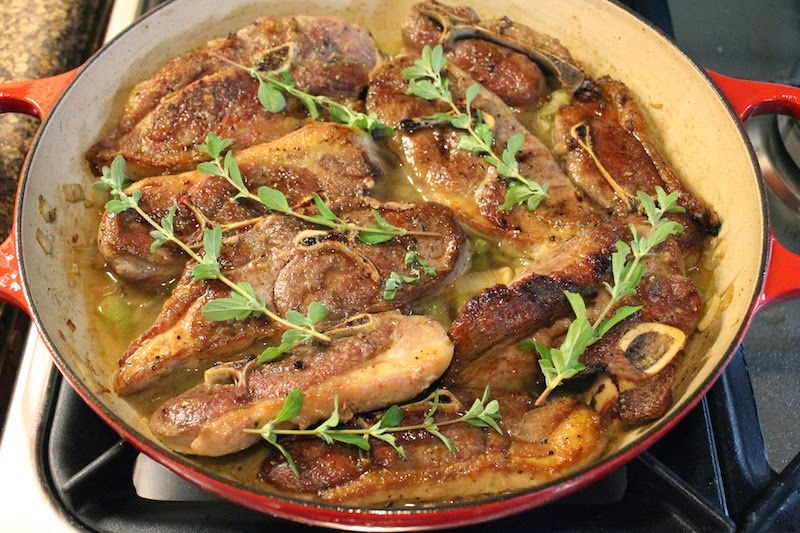 Lamb shoulder is one of the tougher cuts so it is perfect for stewing, becoming melt-in-your-mouth tender as it simmers, creating its own rich gravy flavored by thyme, onion and garlic. Add in some Irish whiskey and lemon juice to brighten the whole pot. This week my Sunday Supper group is throwing a Spring Fling to celebrate spring recipes and my thoughts went immediately to lamb. It is the meat of choice in many cultures and countries for spring, as the weather starts to warm and the lambing begins. We eat a lot of lamb at our house, whatever the season. It’s funny because in my growing up home, we never ate lamb. My grandmother thought it was too strong in flavor and she passed that prejudice on to my mother. It wasn’t until I started dating my British husband, that I discovered the delight of lamb and embraced the baaaah, as we used bleat when discussing lamb. Mom also didn’t like goat cheese for the longest time because she said she could taste the goat. 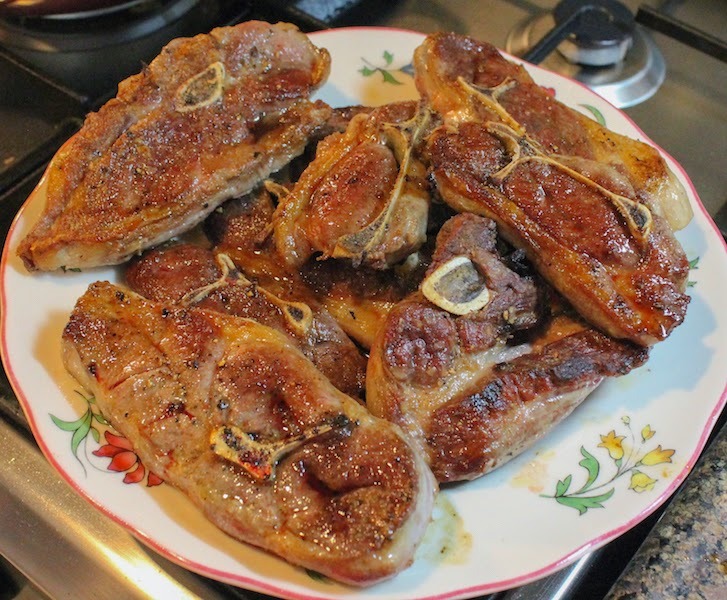 My mother is a most adventurous eater, as I’ve written about here, so I am pleased to say that she got past her own childhood embargoes and will now eat both goat cheese and lamb chops. I am still working on her for leg of lamb or shoulder. 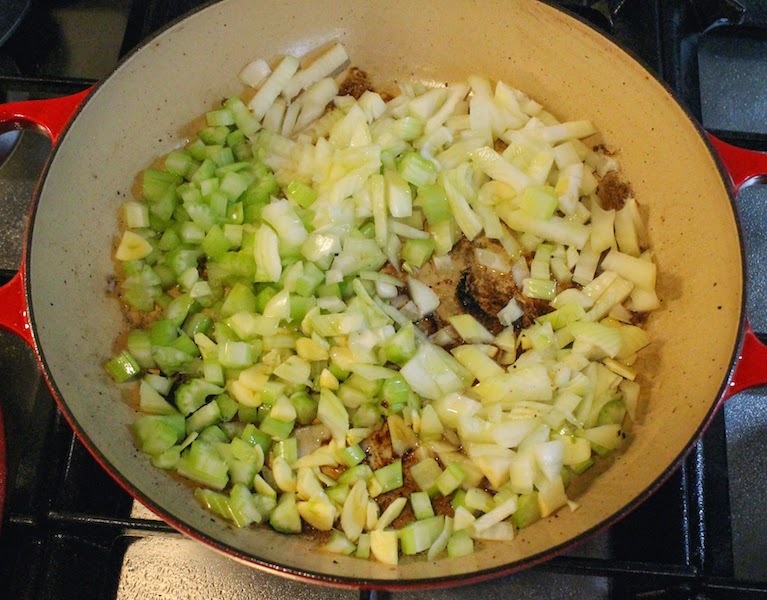 This stew starts with browning the lamb shoulder then adding onions, garlic and celery, along with Irish whiskey and lemon juice to the sticky pan. Then a long slow simmer makes sure that the meat is falling off the bones. When the nights are cold, as they still are in the frozen north of the US - never mind that we have passed the first official day of spring and it’s still SNOWING as I type this in Providence, Rhode Island - this dish will fill the kitchen with fragrant aromas and warm you, body and soul. 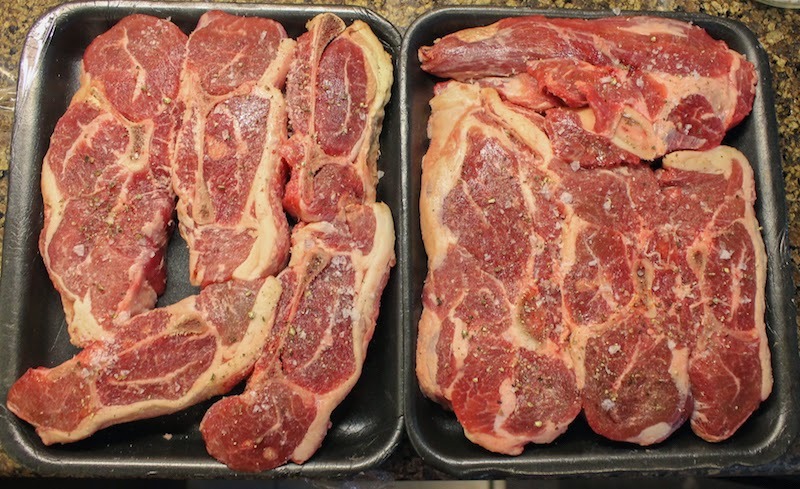 Season your lamb shoulder on both sides with a good sprinkling of salt and freshly ground black pepper. 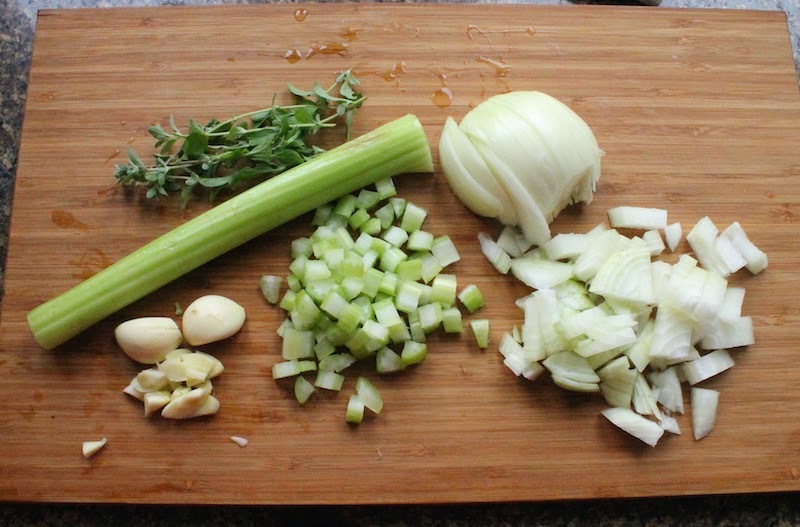 Dice your onion, celery and garlic. Pan-fry the lamb in a little olive oil, just a few pieces at a time, so you don’t crowd the pan and they can brown well. 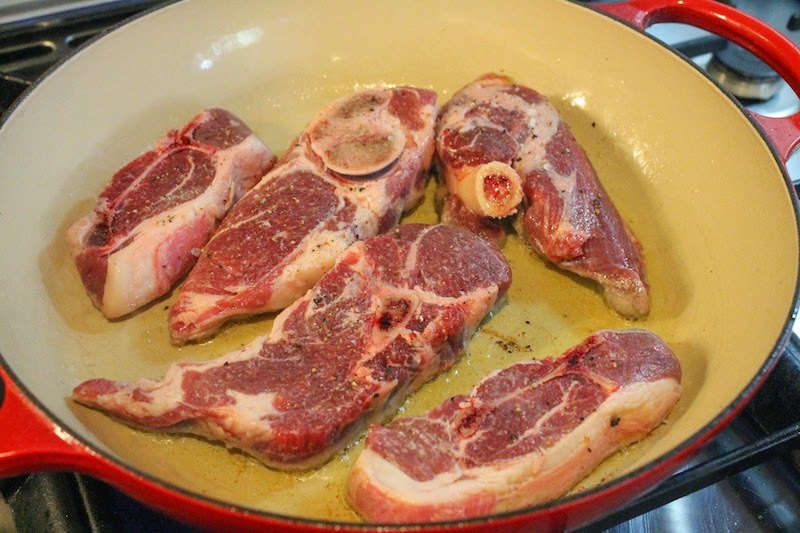 Remove them to a plate and continuing pan-frying until all the lamb is well browned on both sides. 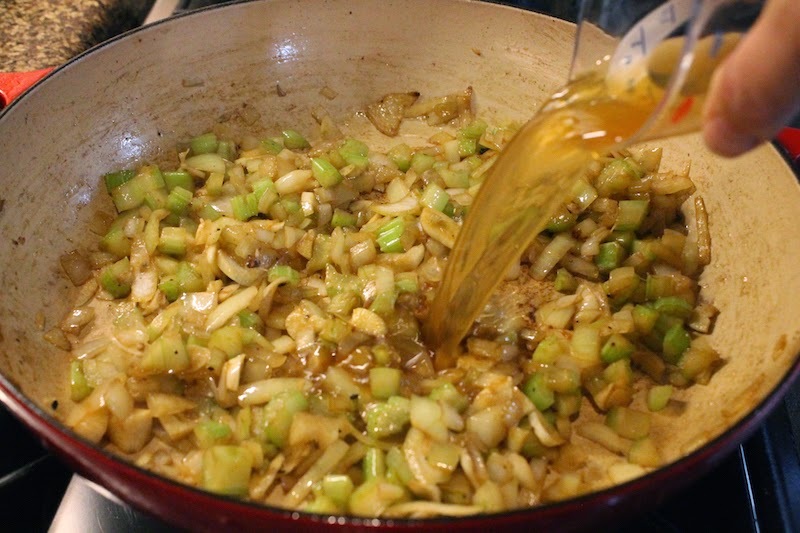 Add the onions, celery and garlic to the pan and give it a good stir. Cook for a few minutes over a medium flame and then add in the whiskey and the lemon juice. Use a wooden spoon or spatula to make sure all the sticky bits on the pan are loosened. 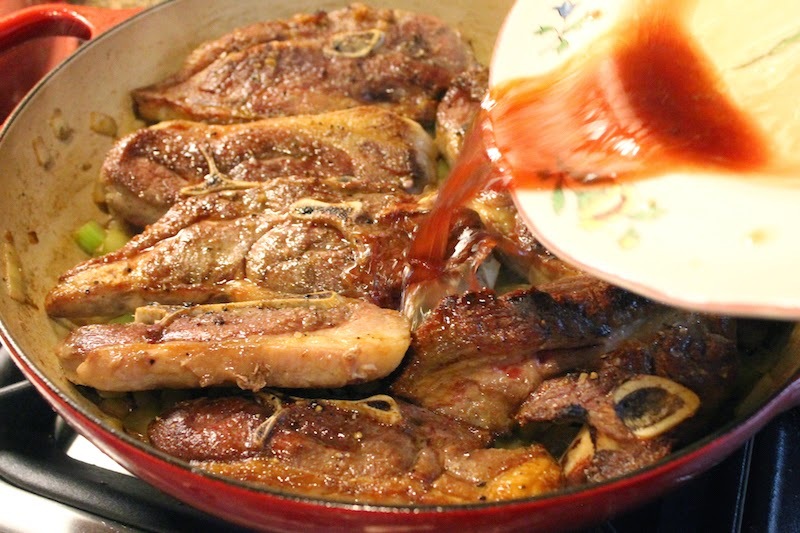 Add the lamb back to the pan, along with any meat juices that have accumulated on the plate. Toss in a few sprigs of thyme and cover the pot with a tight fitting lid. Simmer, covered for at least an hour, but, really, you could leave it for two, checking the liquid level occasionally and adding in a little water if it looks like the stew is going dry. Meanwhile, peel your potatoes and carrots and cut them into chunks. Keep them in a bowl of cool water until you are ready to add them to the pan. 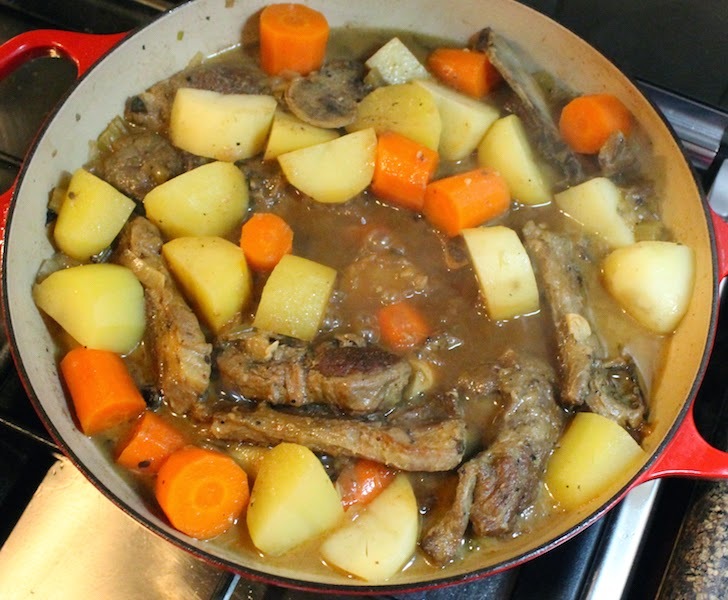 When the lamb is tender, drain the potatoes and carrots and add them to the pan. 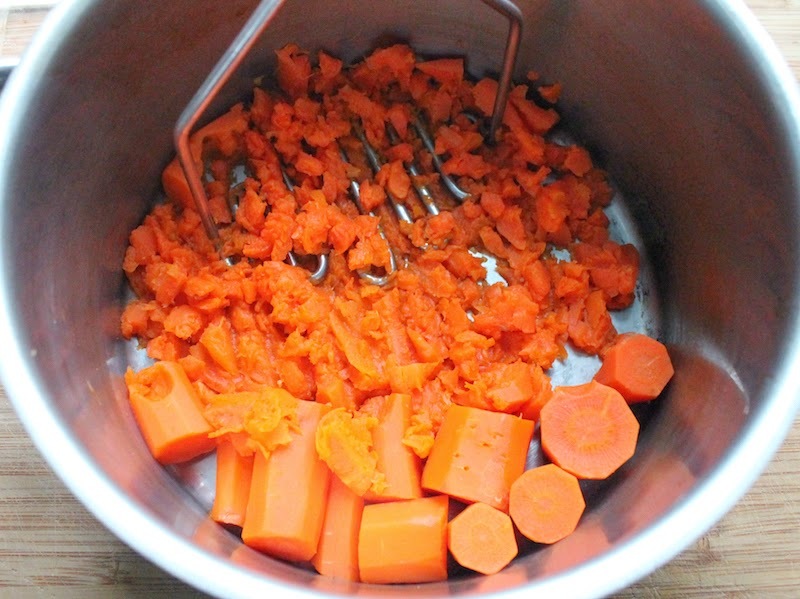 Give the whole thing a good stir to coat the potatoes and carrot with the pan juices. Sprinkle with a little more salt and pepper and add some water to almost cover the meat, if more liquid is needed. Cover your pot again and simmer another hour or so. Check the salt and pepper and add more if necessary. Garnish with a few more sprigs of thyme, if desired. I always serve my lamb stew over white rice because I may not have been raised on lamb but rice and gravy was a childhood staple. In this, my grandmother would have been in complete agreement. 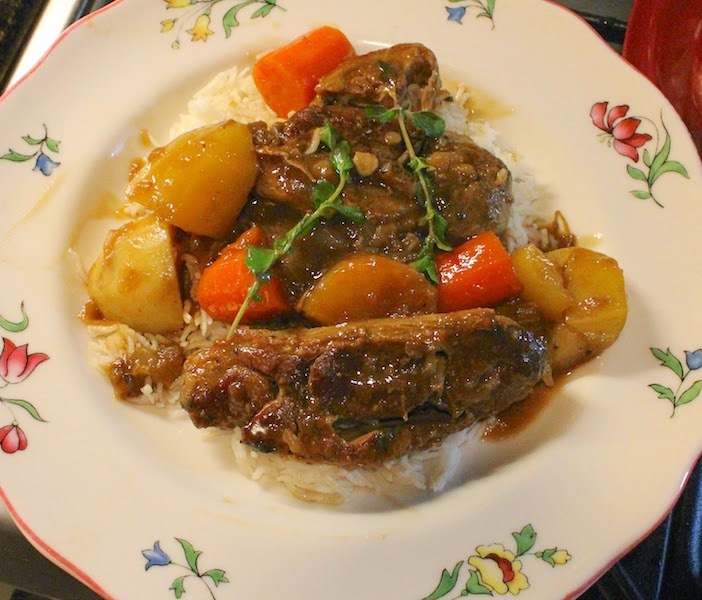 Nothing better for a still chilly spring Sunday Supper than rice and a rich gravy. 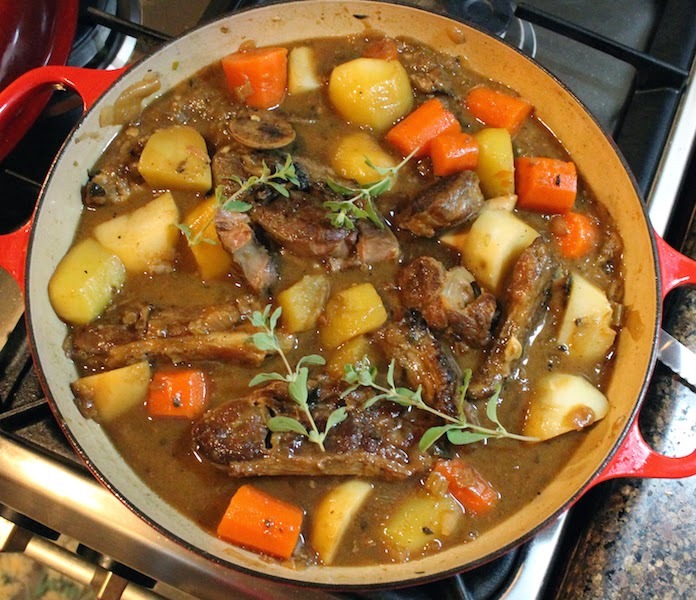 I must confess that I also chose to share this recipe because lamb stew is one of my husband's favorite dishes. It's our 29th wedding anniversary today and although I am in Providence making new memories with our daughters, it is never far from my mind that I owe all of this to him. All of it. Are you ready for spring? I’ve got plenty of recipe inspiration for you today, along with our fabulous hosts, Valerie from Lifestyle Food Artistry and D.B. from Crazy Foodie Stunts and the Supper Sunday crew. 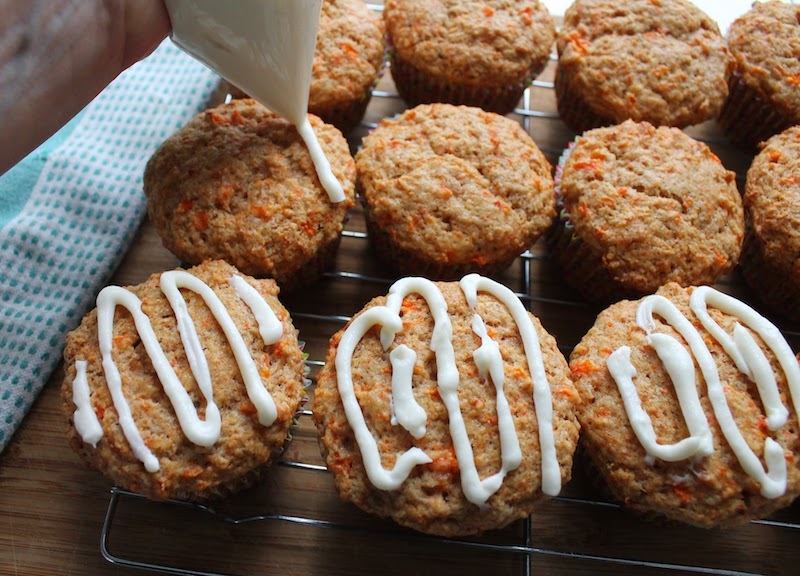 Sticky Carrot Squares by What Smells So Good? 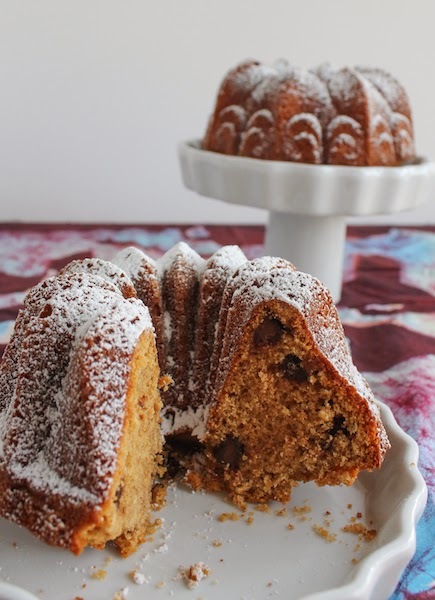 A tender Bundt cake recipe with oats, chocolate chips and peanut butter, made gluten-free, just like the new-this-year Trio Girl Scout cookies. 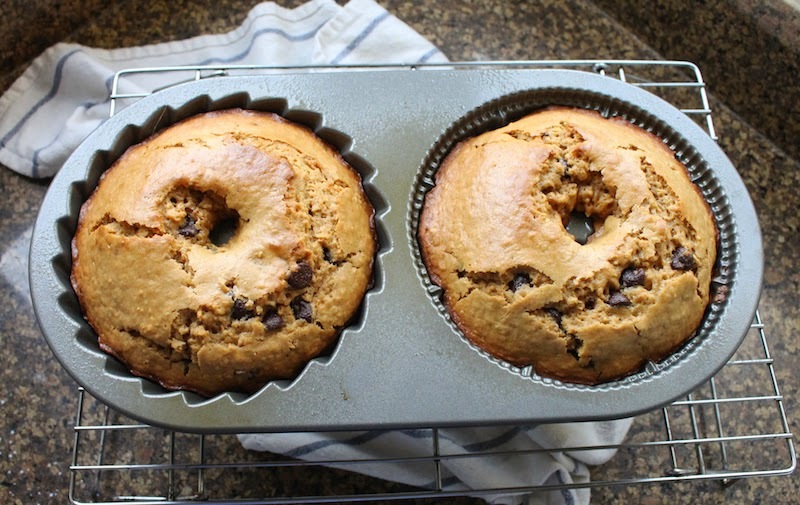 I’ve had a long and happy relationship with the Girl Scouts for many, many years so I was delighted when this month’s Bundt Bakers host Kelly from Passion Kneaded suggested the theme of Girl Scout cookies, using either the actual cookies or the flavors for inspiration. As I wrote here, joining a Girl Scout troop was one of the main reasons I solidified friendships and settled in at a new school, in a new country that was ostensibly my own. That supportive environment allowed me to grow and explore in a safe and creative way. I was a Girl Scout through elementary school and into high school and my fellow scouts have remained my lifelong friends. My first real job after I graduated from university was at the Girl Scouts and I worked with a woman who taught me grace under pressure, how to cooperate with and motivate volunteers and how to comport and express myself articulately in meetings with financial backers. Among other valuable lessons. She gave me scary big responsibilities and made sure I had the support to fulfill them. She reminded me, in fact, very much of my former troop leader in that regard. Our volunteers and area coordinators came from every race, every socio-economic group, every religion. What they had in common was a staunch belief in the innate ability of girls to succeed, to grow, to become responsible, contributing members of society - a society that would be made greater by the educated and creative influence those girls would have, as the strong and capable women they would become, through participation in the Girl Scout program. Years passed and I was blessed with girls of my own. At the first opportunity, I made sure they were able join Girl Scout troops and took turns being troop leader for one of the other throughout the years they were involved in scouting. I saw them learn resilience and perseverance, both leadership skills and how to be a supportive team member, and I saw their natural curiosity and creativity enriched by being part of the Girl Scouts. Girl Scout cookies come in some wonderful flavor combinations, many new since I was involved with the program. My absolute favorite is the Thin Mint, closely followed by the peanut butter cookies, called either Do-Si-Do or Peanut Butter Sandwich cookies, depending on the bakery and region, but I decided, in the spirit of a true Girl Scout, to explore the new and base my cookie on the latest addition, called the Trio. 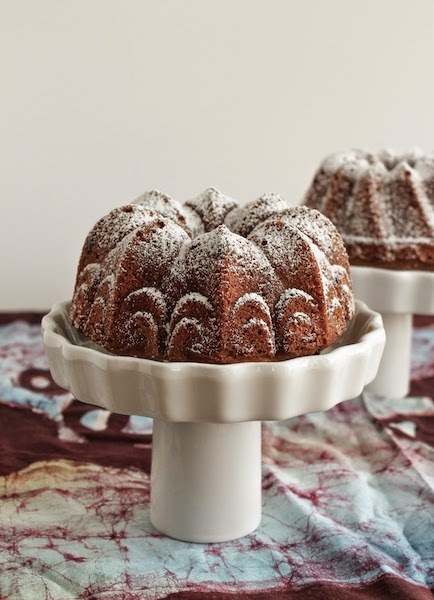 It tickled me to bake my Trio Bundt in a Nordic Ware Duet pan (<Amazon affiliate link) which has a 5-cup capacity but you can use a six-cup pan if you prefer. 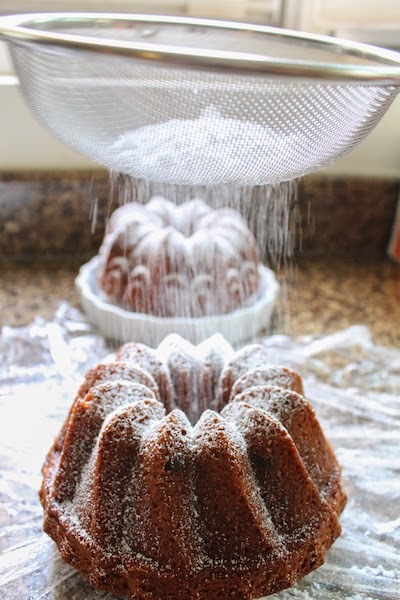 Or even full size pan but the Bundt will just be shorter. Preheat oven to 350°F or 180°C. 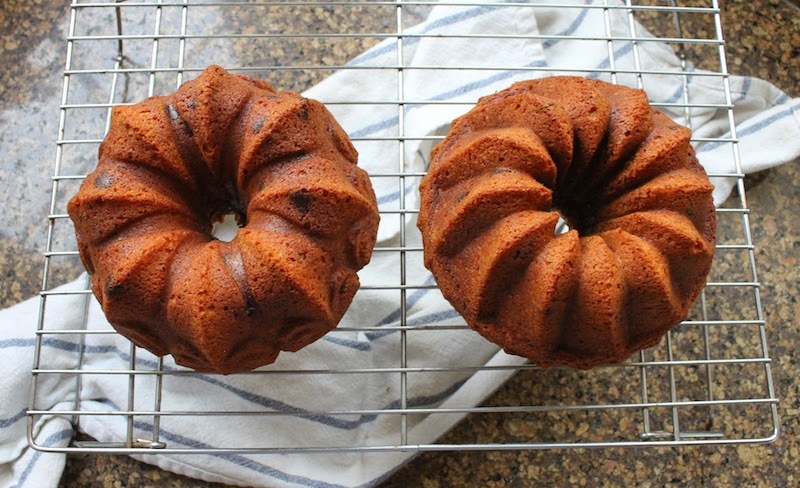 Grease and flour your Bundt pans or pan or use a gluten-free baking spray. 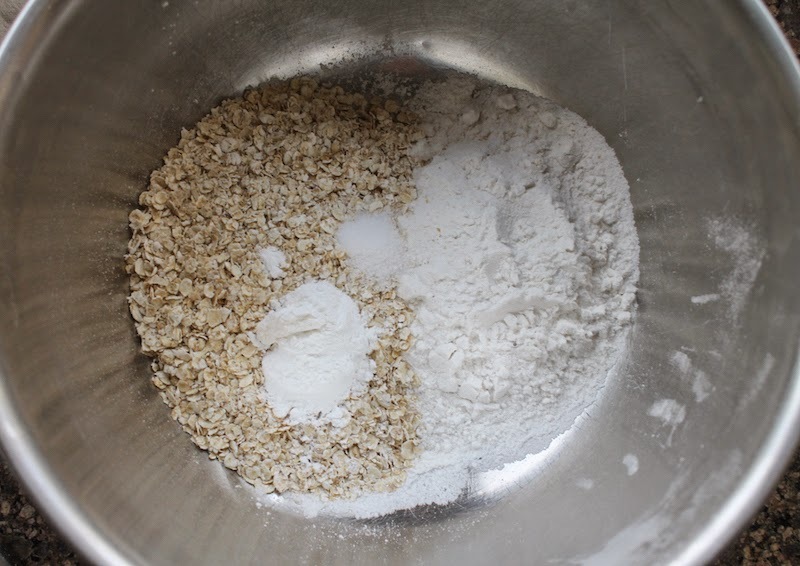 In a medium sized mixing bowl, combine the oatmeal, flour, baking powder and salt. 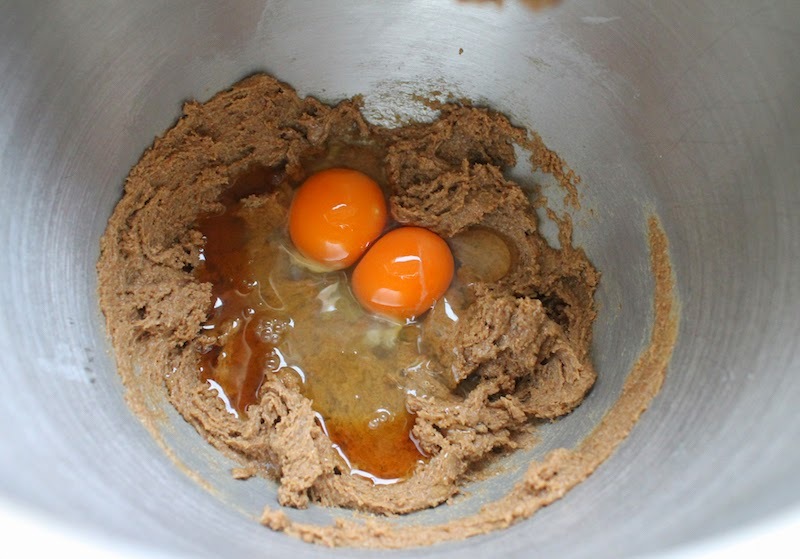 In large bowl, beat the brown sugar and peanut butter with your electric mixer on medium speed until light and fluffy, scraping the bowl down occasionally. Beat in the vanilla and the two eggs. 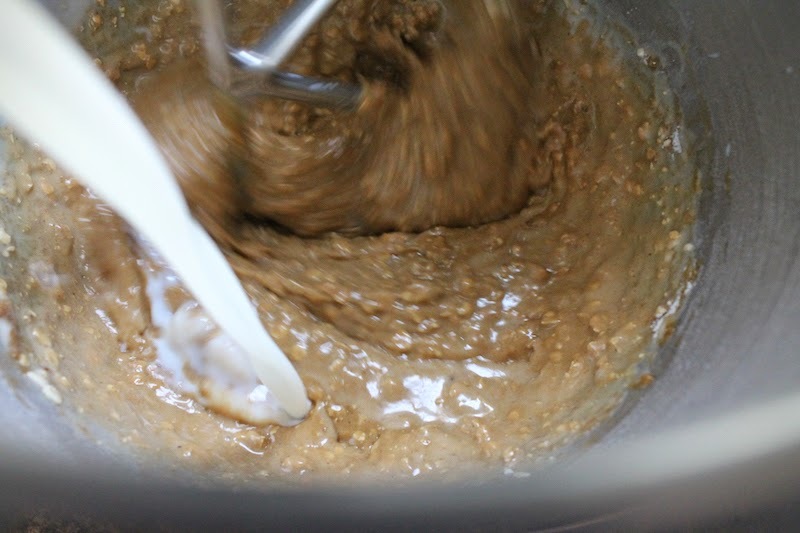 Beat in flour mixture and then pour in the milk as it mixes till well blended, scraping the bowl occasionally. 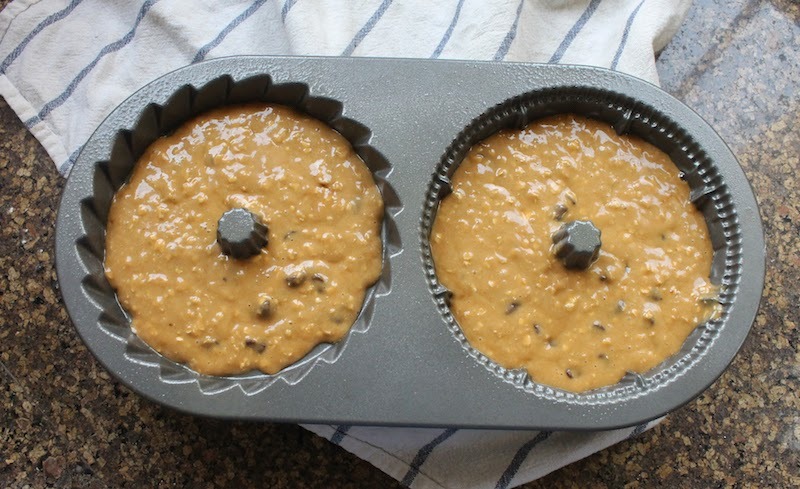 Pour the batter evenly in your prepared pans or pan and smooth out the top. Bake 35 to 45 minutes or until toothpick inserted in center comes out clean. Sprinkle with a little icing sugar before serving, if desired. Of course, Trio cookies don’t have icing sugar but I’m taking poetic license here because it looks pretty. Were you a Scout growing up? What's your favorite cookie? 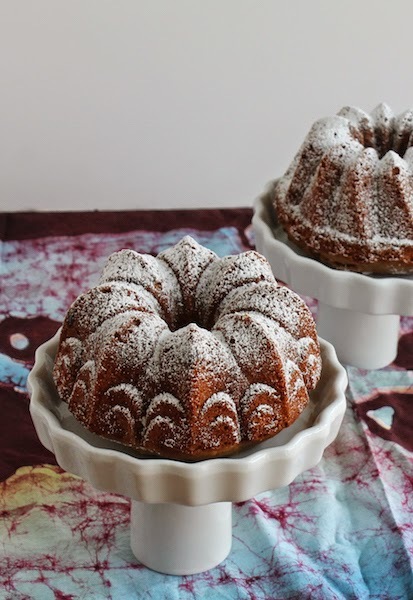 Perhaps it's been recreated as a Bundt cake in this fabulous list of Girl Scout Cookie inspired Bundts! Many thanks to Kelly from Passion Kneaded, our host this month's Bundt Bakers for this great theme.